Worked in the Ministry of Tourism before going on to develop and oversee the running of the private reserve, Futangue Park, within which the hotel is situated. 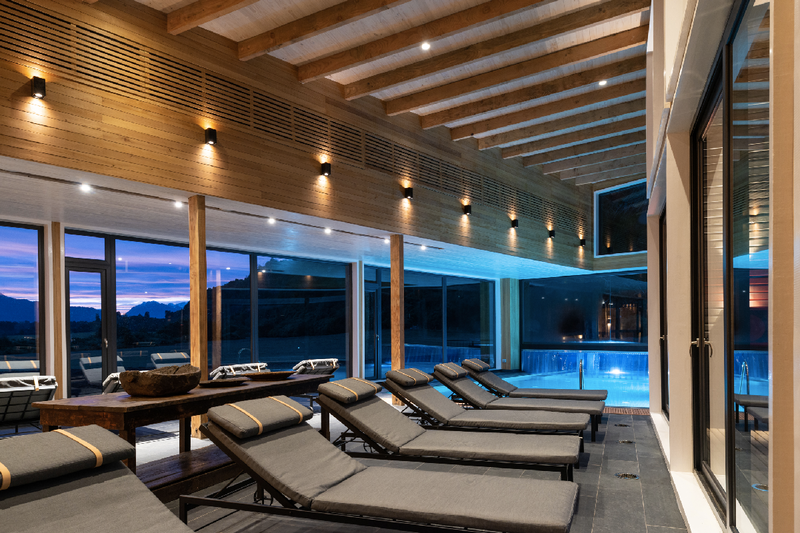 Futangue Hotel & Spa is part of a large conservation project. Situated in the depths of a natural reserve covering 13.500 hectares, where more than 100 kilometers of hiking trails have been created, the bio-diversity of the park is successfully highlighted through the variety of excursions offered by the hotel. 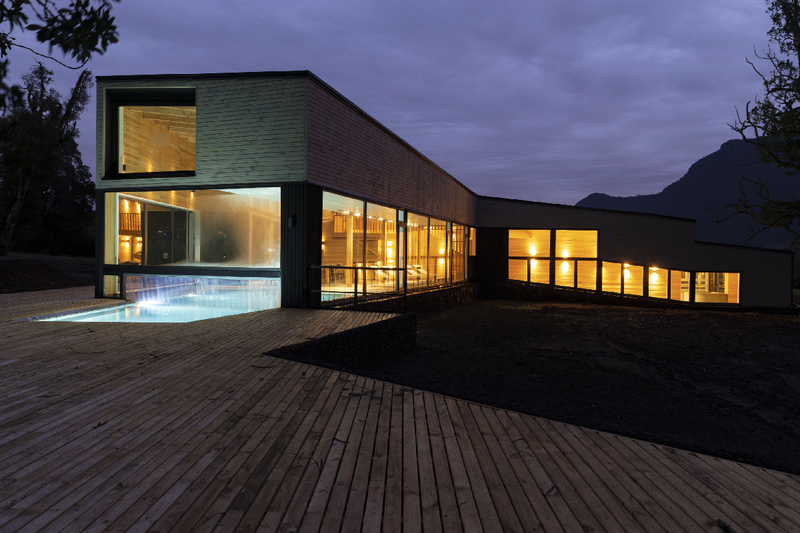 Futangue’s focus is to offer the possibility of discovering a pristine and unexplored place to the luxury market. This is the hospitality brainchild following on from the creation of the park. 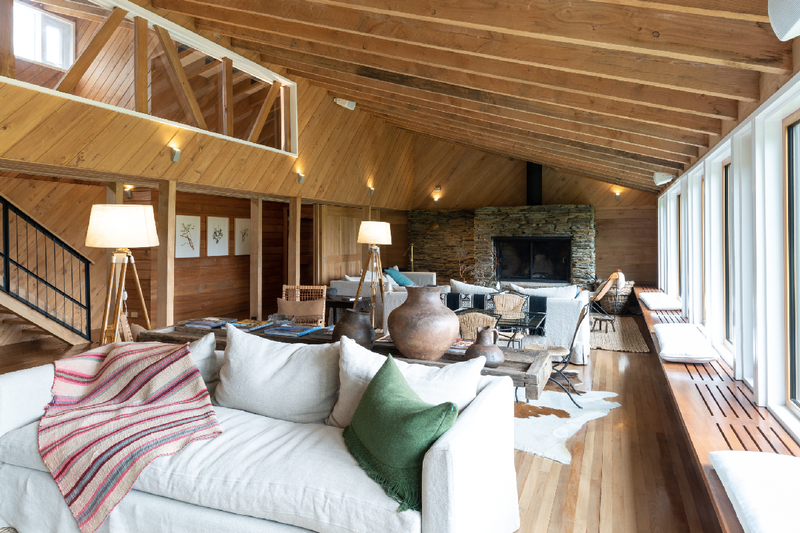 The owners were concerned for the preservation of the native forests in Northern Patagonia. They began constructing a network of hiking trails and at the same time created a foundation, whose objective was to enable education about the environment and bring support to the local community, as well as to encourage academic investigation and social initiatives. Later the decision was made to open the park to the public and the impact of which was so great that development was taken to the next level, to build a hotel so that guests may comprehensively enjoy the variety of activities with first rate integral hospitality. The hotel is part of a private conservation reserve; therefore sustainability and integration with the local community are of its essence. 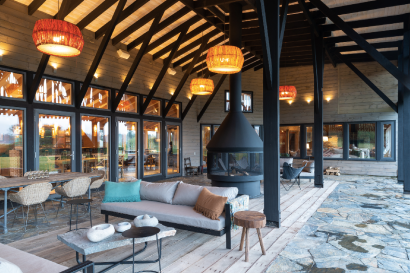 The idea is that the guests can enjoy world-class gastronomy, amenities and spa therapies while surrounded by unique bio-diversity and native forest species. 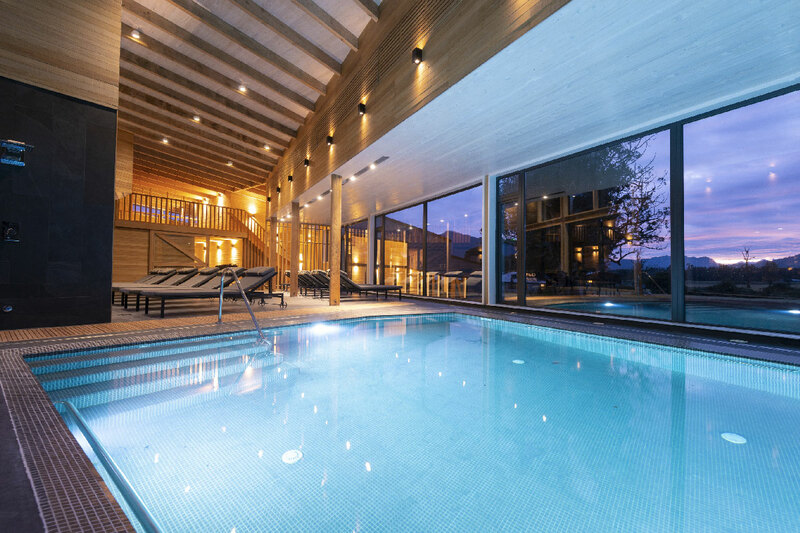 Private reserve: the hotel is situated within a private reserve which covers up to 13.500 hectares, including a network of more than 100 kilometers of hiking trails. The park boasts controlled access, offering total privacy and exclusivity, far removed from the mainstream tourist trail and the possibility of encountering large groups. Variety of Activities: given the extent of this private reserve and the diversity of its landscape, attractions include untouched green lagoons, native forests, mountains and a network of hiking trails to an altitude high enough to provide clear views of distant volcanoes and lava fields. 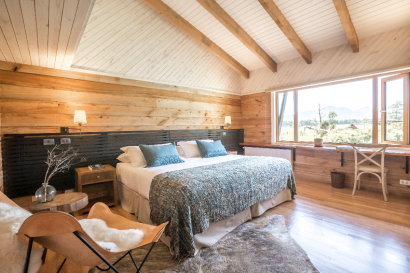 During your stay at Futangue, activities are available such as hiking, rafting, horseback riding, mountain biking, abseiling, fly-fishing and hot springs. Unspoilt surroundings: The pristine ecosystem belonging to Futangue houses a biodiversity of flora and fauna, including endemic species. 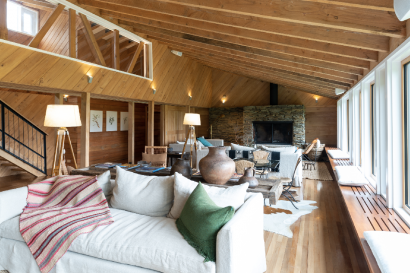 Architecture & Decoration: is characterized by the presence of native wood and the decor is highlighted by the use of indigenous weaves, colorful textiles inspired by national artists and objects belonging to the Mapuche culture. Local tradition is present in every detail of the hotel. 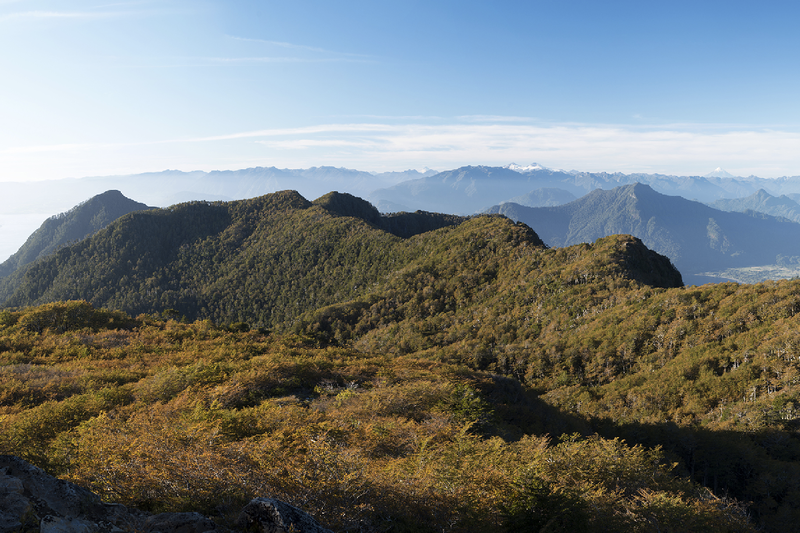 The park is located in the Chilean Northern Patagonia among the foothills of the Andes Mountains in the Los Ríos Region. 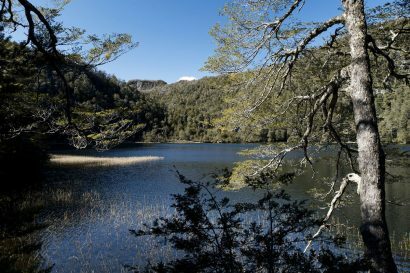 The park is on the shores of one of Chile´s largest and most beautiful lakes – Lake Ranco, and is near to Puyehue National Park, with its stunning volcanic scenery. Enjoy a day’s trekking through extensive virgin forests and discover the art of fly fishing. Get in to a kayak and contemplate the beautiful views which Pichi Lake offers, situated within the enclave of an amphitheater of mountains and waterfalls. Explore the Cordón del Caulle lava fields on bicycle and capture the best views from the viewing decks along the way. Challenge yourself to spend the night in the Valdivian rainforest and listen to the sounds it makes above a sky full of stars. Futangue Park hosted the final of the Redbull Cliffdiving World Tour 2017, in the amazing Riñinahue waterfalls, which are situated within the property. Our guests will have the chance to see where the brave athletes jumped from a 27 meters cliff into the freezing river. Futangue Park is just a few minutes by Helicopter from the Andes mountain range. In this area is possible to do a wide variety of outdoor sports like Helibiking, Heliskiing or Heliflyfishing, in the middle of stunning volcanic landscapes, covered with lava fields and geysers. We host our own trail running race called the “Futangue Challenge” with 4 distances from 13K to 62K. Besides the experience of running surrounded by such beautiful scenery, the race gives two direct qualifications (1 man, 1 woman) for the Ultra Trail 2019 in Trilhos dos Abutres, Portugal. In Futangue it’s possible to do activities to suit all tastes and interests, for both children and adults, including sports and nature, leisure and cultural tours of fascinating variety : hiking, fly fishing, bird watching, mountain biking, horseback riding, kayaking, nature photography, bathing in hot springs, and visiting local villages are just some of them. 2 suites measuring 35 m2. 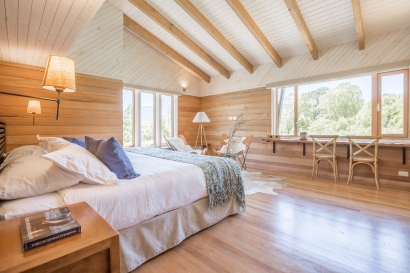 All feature native wooden floors. Amenities are based on local products. Furnished with either a king-size bed or two single beds. In our restaurant “Mesón del Caulle” we serve outstanding signature cuisine and place value upon the identity of Northern Patagonian recipes. 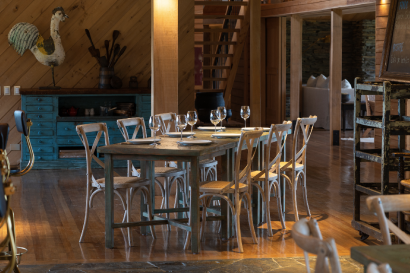 The concept and approach was designed by renowned Chilean chef, Karime Harcha, pioneer in rescuing the products of our region. The vegetables are sourced primarily from local produce, most of which is grown in the hotel kitchen garden. The restaurant offers from half-board to all inclusive plans. There is one bar at the restaurant. – 60 m2 events room, with a capacity for 50 people. – Private reserve which covers up to 13.500 hectares, including a network of more than 100 kilometers of hiking trails. – Private beach access in Lake Ranco. 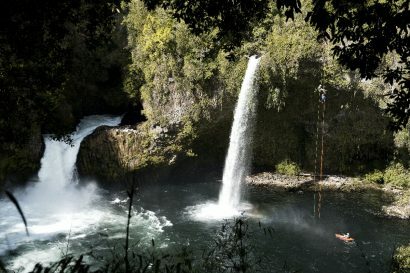 – Rafting and rappelling in the Riñinahue River, only 4 minutes driving from the hotel. 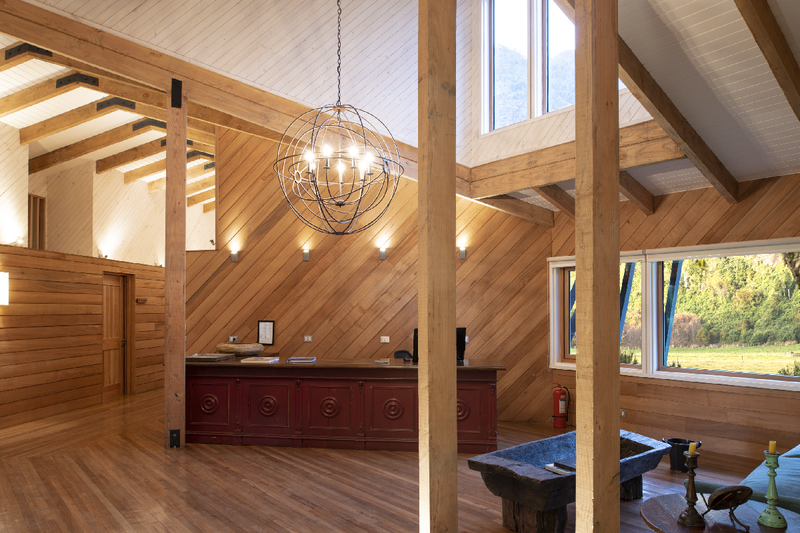 – Our guides offer lectures in the hotel about different themes like volcanoes, native animals or the mapuche people, so the guests can learn from the natural and cultural heritage of our region.